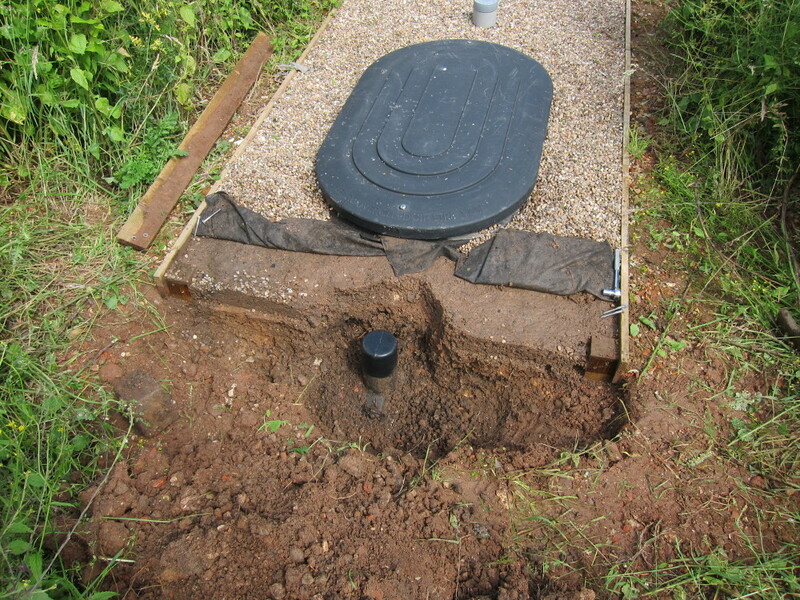 There is no mains drainage available at the site so the plan has always been to use a small sewage treatment plant for the new house and to install this early so it can also be used by the static caravan during construction. The old house had a traditional brick septic tank, discharging into the field drainage ditch, but this was well past its best and those old designs simply cannot match the treatment quality of modern systems. Some time ago I settled on using a Biorock system. 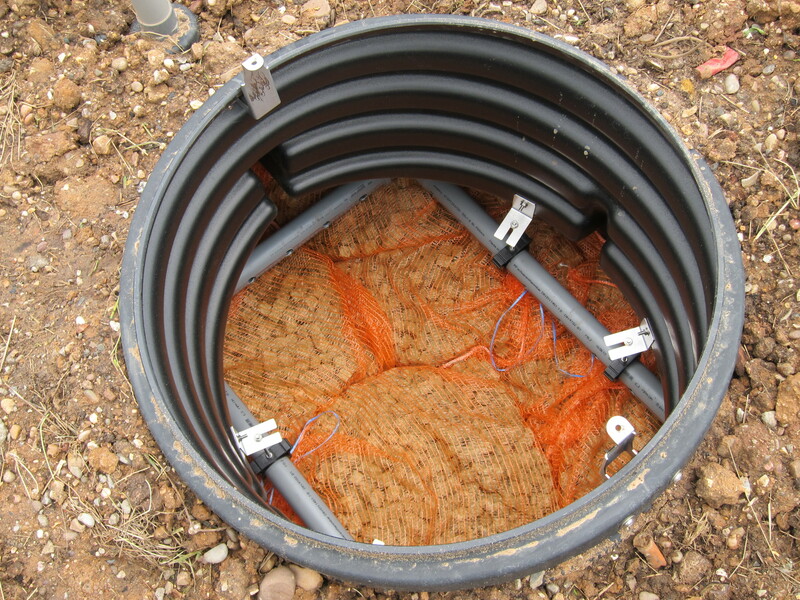 These are one of a handful of designs that don’t require an electricity supply: most other systems rely on either an aeration pump or rotating discs to treat the effluent whereas the Biorock system relies on natural ventilation of a treatment unit with aerobic bacteria hosted on a stack of foam cubes contained in string bags. While a Biorock unit is more expensive than the alternatives the zero electricity cost offsets the higher purchase price relatively quickly and the sheer simplicity of the system is very appealing. Upstream of the main Biorock treatment unit there’s a separate, large settlement tank divided into two sub-chambers with a brush filter on the outlet which keeps solid matter out of the Biorock unit itself. Downstream of the Biorock there’s a small vertical access shaft for sampling the final discharge quality or, if necessary, for installing a pump to raise the treated effluent to a higher level. One characteristic of the Biorock system is that the main treatment chamber is relatively dry, holding just a shallow layer of water at the bottom, and as a result the outlet is 1.15m below the inlet and the outlet must be allowed to drain freely. On a flat site this means a pump is often required whereas on a sloping site it can be possible to do everything by gravity. 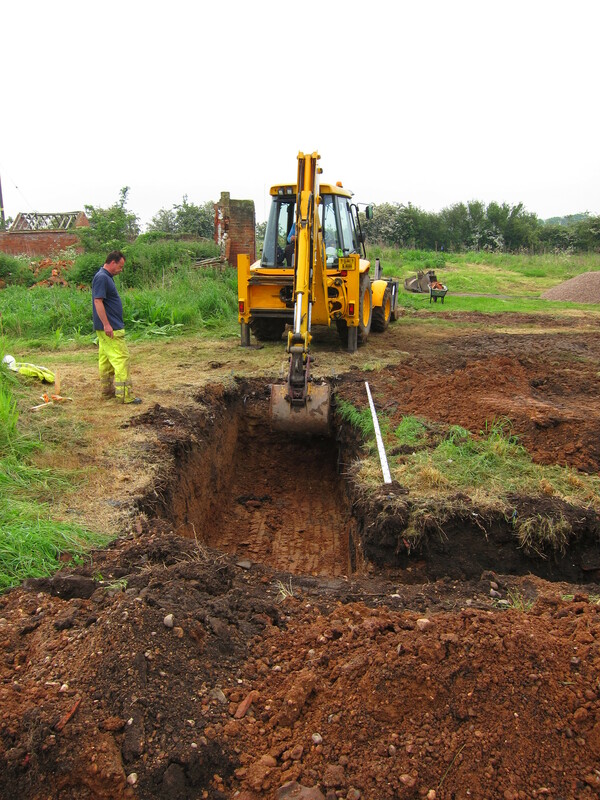 On my site it proved just possible to arrange for a gravity outfall to the same drainage ditch used by the old septic tank, though some of the pipe runs are at the minimum permitted gradient (1:200 for treated effluent) and the Biorock unit needed to be located with the top roughly 0.8m above the current ground level in its immediate vicinity. 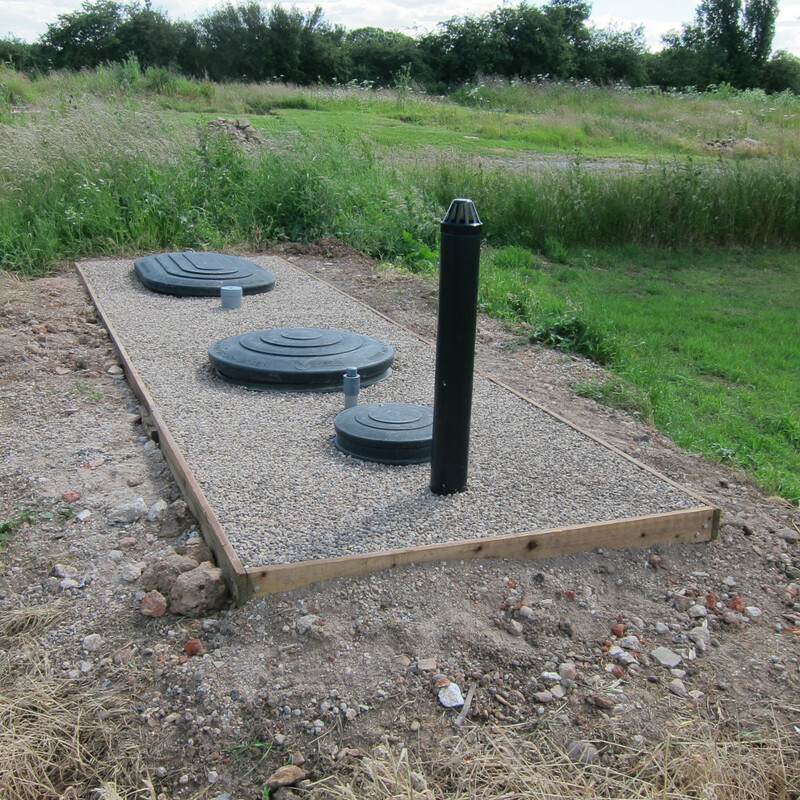 The ground level will be raised later as part of the site landscaping scheme. 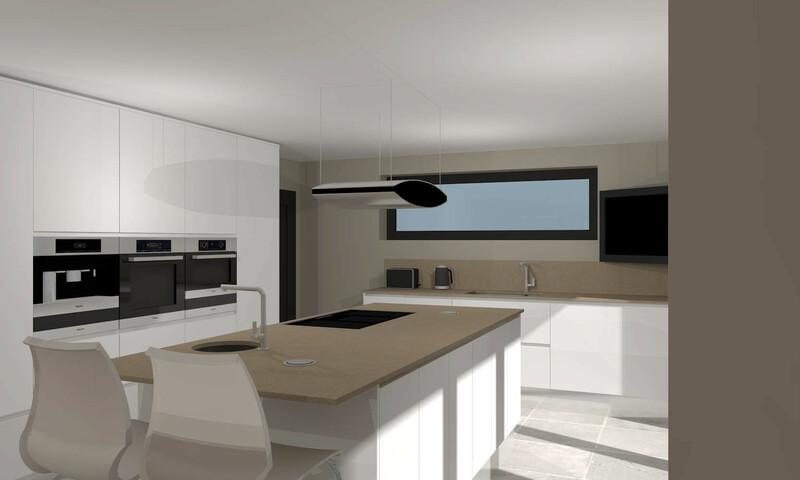 With the Biorock being relatively unusual in the UK (my architects, my structural engineer and my building control inspector had not come across one before) there aren’t that many installers who are experienced in the specific requirements and I wanted to ensure the installation was done correctly. 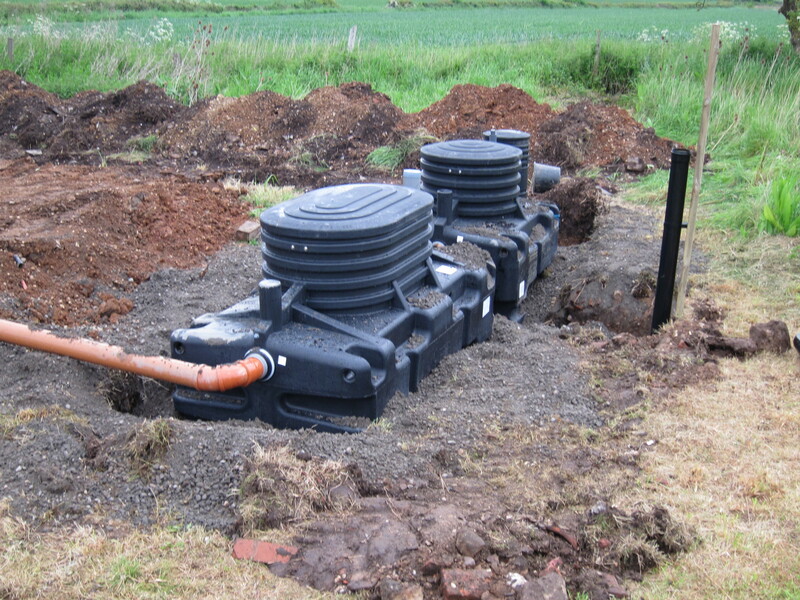 Biorock UK recommended Mike Welton of Welton Environmental and Mike did a great job, installing the tanks and about 50m of inlet and outlet pipework in 3 days with just the help of a good local JCB and operator. The primary tank (foreground) and the Biorock tank with dry-mix concrete back-fill. The inlet pipe (left of shot) is just temporary to permit the tanks to be partially filled to balance the pressure of the back-fill. After just over a year, the Biorock system is still working perfectly. 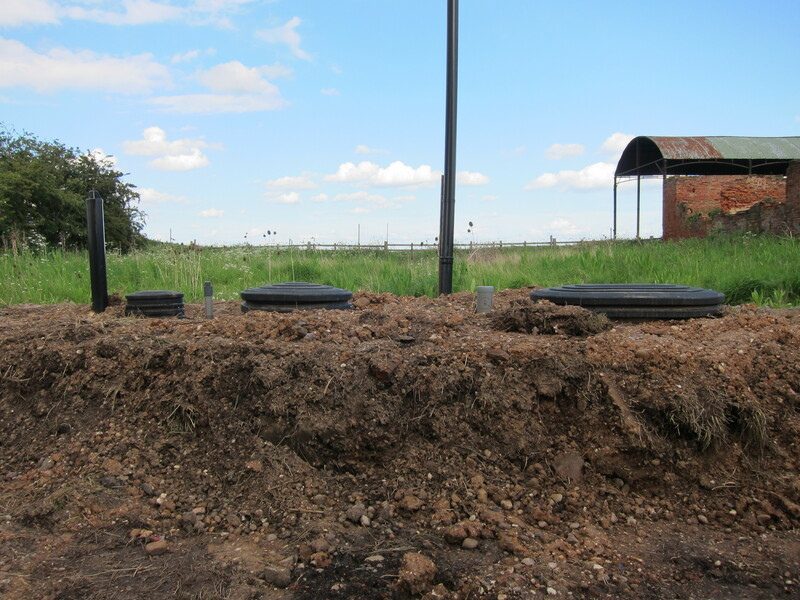 The soil around the tanks had grown lots of weeds so, since this is a permanent installation and part of the future garden, I decided it would be better to lay some gravel to stop the weeds and tidy up the area. While that’s not quite as simple as it sounds – the gravel needs some sort of enclosure and there needs to be a layer of landscape fabric to stop the weeds growing through the gravel – the finished result looks good. I also secured the bottom of the vent stack in concrete to stop it moving. Another year on and the system has been working perfectly – up until recently. The new house has been under construction since October 2015 with a small core team on-site every day and various subcontractors coming and going at other times. Somewhere down the line one of the subcontractors evidently thought it was acceptable to flush kitchen towels down the site toilets. This would be asking a lot of mains drainage and was never going to turn out well with a system like the Biorock. The brush filter on the outlet from the Primary tank stops anything getting into the Biorock unit itself but it’s still possible to get a blockage at the inlet to the Primary tank. The problem showed up as a raised water level in the manhole leading to the primary tank. Rodding it helped temporarily and definitely moved water into the primary tank but the level in the manhole didn’t drop. It took a while to work out what was happening and there’s not much to see from inside the Primary tank – just a translucent white box around the inlet – so the cross-sectional sketch below should help to make things clear. Under normal circumstances the sewage flows in from the left and then drops into the vertical tube. Generally that works fine and everything clears down the tube but there’s a risk of a blockage forming near the top of the vertical tube. If that happens there’s an overflow out of the top of the white plastic box, but that’s roughly 150mm above the normal tank level – hence the raised level in the upstream manhole. 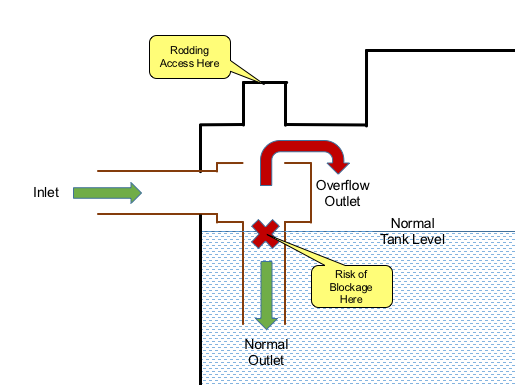 The only way to clear such a blockage is to come in from the top of the tank and rod down the vertical tube. There’s an access point (possible air vent location?) moulded into the top of the tank which is directly above the vertical tube (I wasn’t completely certain that would be the case, but it is) and for my installation that was still closed off and I had to cut the top off with a hacksaw. Not predicting the need to gain such access I’d foolishly located the end gravel board directly over the centre of the access port! 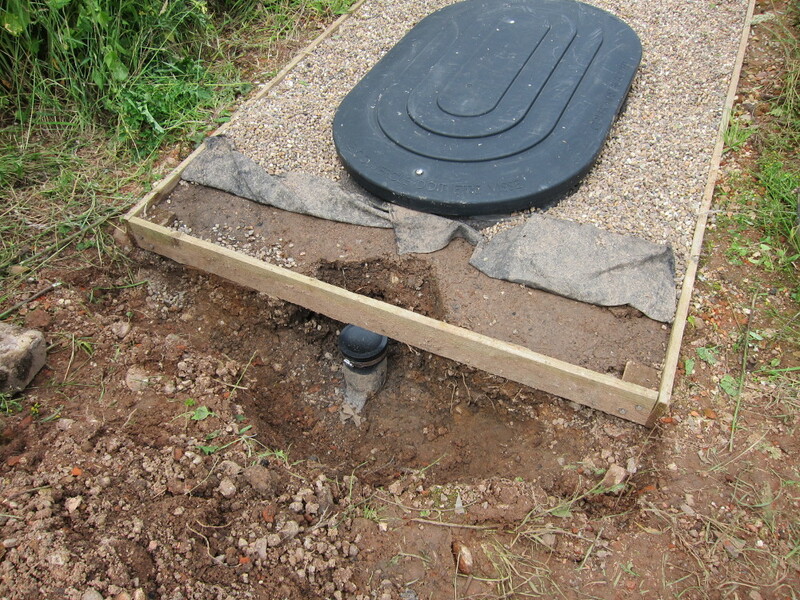 My Plan A was to permanently fit a screwed rodding point at ground level but I can’t face re-working the gravel boards right now so I just fitted a flexible rubber end cap and put the gravel board back over it. The “pipe” is nominally 110mm diameter but it is moulded in thick polythene and not as accurate as an extruded PVC pipe would be, so a flexible coupling secured with a stainless steel Jubilee clip is a good way to go. Judging by the drawing of the latest specification of BIOROCK-ST1-3000 Primary tank from the Biorock website (PDF link here) it looks like it might now be standard practice to fit an accessible rodding point in this location. I’d definitely recommend doing that on any new installation. Despite this minor setback which was directly attributable to misuse of the system it’s working very well and I continue to thoroughly recommend the Biorock products. The quality of the treated discharge remains excellent.